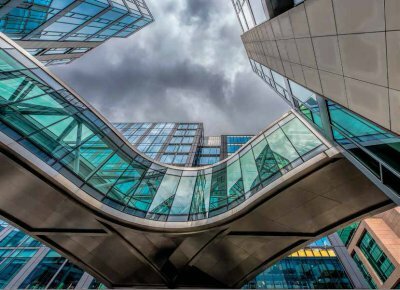 Architectural photography can apparently be bad for your health. I spend so much time looking up at buildings that, not surprisingly, I quite often suffer neck pain!! Only joking of course, but I spend so much time looking up, that others often look up thinking they are missing something. And possibly they are, as they maybe do not see or appreciate what I am seeing. Also there are often obstacles put in my way, by being stopped from taking photographs due to ‘security reasons’ or ‘copyright’. However, these obstacles do nothing to reduce my passion for this genre of photography. I simply love architecture. The blame for my passion, if that’s what it can be called, lies fairly and squarely at the door of the Societies. My journey towards ‘Building an Image’ started with The Societies about six years ago. Up to that point I had always yearned to be a proficient landscape photographer. 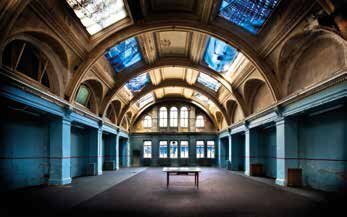 However, in May of 2010, in the Monthly Competition, I was thrilled to get my first Silver Award for an image of The Titanic Drawing Office in Belfast. Previous to this I really only had a passing interest in architecture, and never thought it would develop into a passion. Now, even when on holiday, my eyes always navigate to the architecture of the places visited. No interest in beaches or bars, unless of course the bar is in an architecturally interesting building!! My passion also encompasses a huge respect for the architects, and those involved in the actual building of the structures. I try to get a feeling for the buildings I photograph, and add drama where I feel it is appropriate. I have equal passion for both modern and more traditional architecture, but marvel particularly at the achievements of those responsible for classical architectural structures. Further Bronze and Silver Awards followed into 2011, again for architectural images. When the awards system changed to Highly Commended and Gold, I continued to achieve Highly Commended for a number of images, until in April 2012 I achieved my first Gold Award, for an image of the new Titanic Building in Belfast. It was at this point that I thought ‘I must be doing something right’.